Africa's spotlight is very much focused on the illegal ivory trade and protecting our elephants from the rampant killing for selfish gain. But, there's another untold story that's unraveling behind the scenes - elephants are taken from the wild and held in captivity, enduring appalling cruelty in the name of tourist entertainment. It's very commonplace to see elephants being used for tourist rides and shows across Asia - elephant rides are a popular and lucrative tourist activity there. 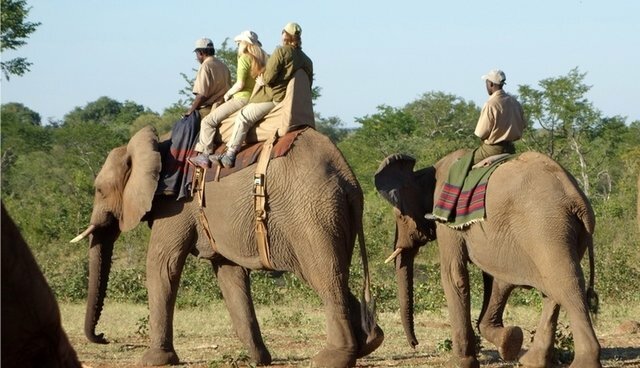 But in Southern Africa this was not the case, until the late 1990s when the trend of elephant rides was introduced in Africa and it then spread through South Africa from 2001. The levels of abuse inflicted on these elephants in Southern Africa is appalling: they are taken from their mothers, their spirits are broken, and they endure cruel and stressful "training" to make them tolerate being ridden. Many of them wear the scars of the bull hooks used to control them. It is a sad reality, but with help from tourists and tour operators, we can stop these elephant rides in their tracks before it's too late. In fact, elephant rides remain a cruel and unnecessary means of tourist entertainment. From Cape Town to Cairo, from Calabar to Nairobi and elsewhere in Africa, millions of local and international tourists experience memorable visits and continue to do so through safaris to have a glimpse of and relate to wildlife, where they belong. We believe this is a win-win for all - local communities, governments, businesses who derive economic benefits, tourists who are entertained, and animals who are able to express natural behavior and offer entertainment without undergoing needless suffering. To put an end to elephant rides, you need to watch out for: elephants used as photo props for tourist selfies or forced to perform tricks, in addition to giving rides. Most parks are in South Africa, where 144 captive elephants are held in at least 28 different venues. A further 47 are held in seven elephant parks across Zimbabwe, 13 in two venues in Zambia and 11 elephants in two venues in Botswana. Captive elephants are also bred to be sold to other operations, or abroad to Asian elephant parks. 24 young elephants were recently sold and exported by the Zimbabwean government to Chimelong Safari Park in China. They will suffer a life of abuse performing in shows and giving rides. At least 50 more elephants in Zimbabwe are being held in a holding facility and await a similar fate. It really doesn't have to be this way, we are very fortunate here in Africa, in that we can view animals in the wild - where they belong. We know that the tourists who love animals will be shocked about the cruelty behind the scenes of elephant rides and they will no longer want to take part. So while we appeal to tourists to not ride elephants, we at World Animal Protection also appeal to the travel industry to end cruel wildlife tourism. As a result of our work so far, over 20 travel companies around the world, including TUI Nederland, Intrepid Travel, Apollo, Albatros Travel and World Expeditions have stopped offering and promoting elephant rides or shows to their customers. We're calling on all operators to do the same – and to show their commitment by signing the World Animal Protection elephant-friendly tourism pledge. Elephants matter not only because of their environmental importance, their beauty and power, and their value to Africa's economy, but because their very existence symbolizes stability, security, and the achievement of authority to protect one of our best-loved assets: our wildlife. Top photo: Elephants carrying passengers in southern Africa.